I’ve confessed that I cheat a little right? You’ve realized I’m not Martha right? We’re clear on this right? We’ve reached that point in our relationship where we discard with niceties right? Ok. It’s settled. Either you already figured it out or I’m telling you now. I like shortcuts. I love traditional Indian cooking. But I like shortcuts too. I need shortcuts. It’s how I get by. Dosa is not generally the “easy, go-to” dish. But over the last year, we’ve been enjoying easy dosas made from mixes of nutty and savoury flours laced with spice temperings of smoky mustard seeds, hot green chilis and curry leaves. And when too busy for even that, I just sprinkle in a little salt and cayenne pepper. These make for a perfect toddler meal too. I tear the dosa up into bite size pieces, and Surya happily dips them into a little yogurt. I also dice up a few pieces of Bedakar’s Mango Pickle for her (what can I say – the kid is about as desi as they come). It’s still a bit too spicy for her young palate so I rinse the pickle in water before cutting and serving. Semolina combined with the rice and all purpose flour makes this dosa really crunchy. Try adding toasted cumin seeds and sauteed onions or make your own variation. 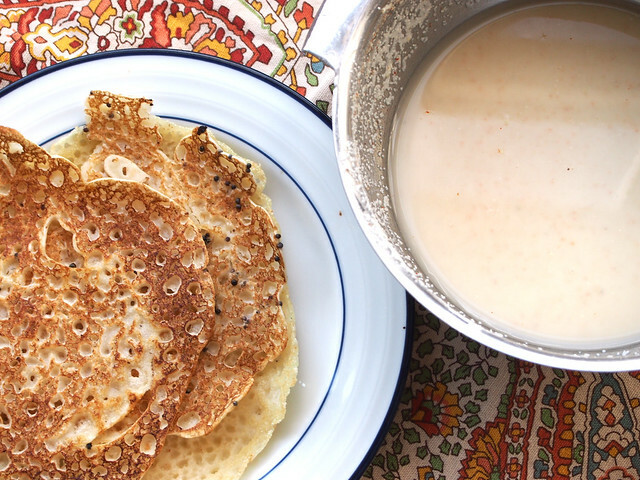 Unlike regular dosa, you sprinkle the batter over the hot pan with your hands creating a lace-y like look. In a small skillet, heat about a tablespoon of oil and add mustard seeds. Let them pop and sputter then add the green chili and curry leaves if using. Cook for about 1 minute. Mix semolina flour, rice flour and all purpose flour in a mixing bowl. Add the mustard seed mixture and salt. Add enough water to make a very thin batter. It should be liquidy and thinner than pancake mixture. Heat a wide and flat skillet. Add about a teaspoon of oil. Sprinkle the dosa batter on the pan using your hands. Drizzle a little oil over the top of the dosa. Cook until the bottom is golden. Flip and cook another few seconds. If you want to see how to pour the dosa, check out this video from the Vah Chef.